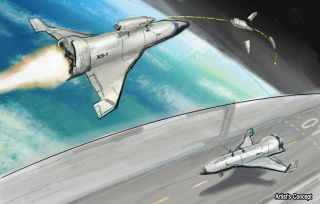 An artist's concept of DARPA's Experimental Spaceplane (XS-1), a proposed robotic space vehicle that could fly 10 times in 10 days and lower the cost of putting satellites in orbit. The U.S. military's plans to build a satellite-launching robotic space plane are moving forward. On Monday (May 23), the Defense Advanced Research Projects Agency (DARPA) put out its official call for proposals for the futuristic space plane design. The goal of the Experimental Spaceplane (XS-1) project is to build a reusable space plane that, at optimal operation, should be able to fly 10 times in 10 days, at a cost of no more than $5 million per flight. Typically, space vehicles are not fully reusable, and the pieces that are reused need to undergo time-consuming safety checks between flights. XS-1 would be used primarily as a cheap and fast way to deliver satellites to orbit, DARPA officials said. The XS-1 program has four primary technical goals, according to DARPA. The first is a plane that can do 10 flights in 10 days, and demonstrate "aircraft-like access to space." Second, the plane must be able to deliver a payload into low Earth orbit, which means it has to be able to move very fast. It must be able to launch a payload weighing up to 1,500 lbs. (680 kilograms) and have the capability to upgrade to 3,000-lb. (1,360 kg) payloads. And, each flight of the space plane, even with its heaviest payload, can't cost more than $5 million. In an era of declining budgets and adversaries’ evolving capabilities, quick, affordable and routine access to space is increasingly critical for both national and economic security," DARPA officials wrote in a statement on the agency's website. "Current satellite launch systems, however, require scheduling years in advance for an extremely limited inventory of available slots. Moreover, launches often cost hundreds of millions of dollars each, due in large part to the massive amounts of dedicated infrastructure and large number of personnel required." "DARPA created its Experimental Spaceplane (XS-1) program to help overcome these challenges and create a new paradigm for more routine, responsive and affordable space operations, reducing the time to get capabilities to space," officials said in the statement. The XS-1 program began in 2013, and initially DARPA aimed to make the first test flights in 2018. More recent estimates put the first flights sometime in 2019 or 2020. The program is currently broken into three phases. Phase I sought to "evaluate the technical feasibility and methods for achieving the program's goals," according to the DARPA website. In 2014 and 2015, during Phase 1, the agency awarded funds to three groups working on XS-1 designs: Northrop Grumman, partnered with Virgin Galactic; Boeing, partnered with Blue Origin; and Masten Space Systems, partnered with XCOR Aerospace. The three groups have released simple, digital renderings of what their XS-1 designs would look like. DARPA announced in April that it had received funding from the Obama Administration to move into Phase 2. This week's announcement puts a final deadline on XS-1 design proposals, which can include previously tested technologies or totally new ideas. The call for proposals is open to anyone, not just those companies that have already received funding. The military has another reusable space plane in operation: The X-37B space plane, which hops a ride aboard a rocket and can then orbit the Earth for months at a time. Built by Boeing, the two X-37Bs have launched on a total of four missions in six years. Just what they're doing up there is a mystery; most X-37B payloads are classified.